Turkish Prime Minister Recep Tayyip Erdogan has sought to reassure the country’s Jewish community, saying that he will ensure its safety, Anatolia news agency reported. Two American-Jewish men reportedly approached the Turkish PM while he was attending the Rio 20 United Nations Conference on Sustainable Development to ask him "to protect" Jewish people living in Turkey. "Under my leadership, the Jewish community in Turkey is safe," Erdogan said. "They are under my protection. We see [Jewish people] as brothers." "We have no problem with the Israeli people," Erdogan said in response to a question. "Our problem is the aggressive behavior of the Israeli government. We have to find solutions to problems in the Middle East. The Israelis have to treat the Palestinians better." Anti-Zionism in Iran slipped into outright antisemitism at a UN conference in Tehran when the First Vice President of Iran, Mohammed Reza Rahimi (pictured), blamed the international drugs trade on the teachings of the Talmud. Fox News covered this story - a rare diatribe by an Iranian official targeting the Jewish faith. 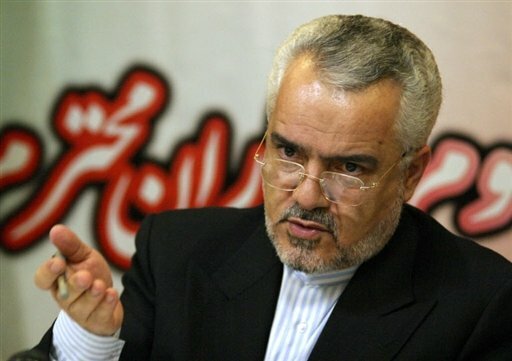 The teachings of the Jewish book of law, the Talmud, are a driving force behind the international drug trade, Iranian First Vice President Mohammad Reza Rahimi said in comments reported Wednesday. Rahimi's remarks, at an international anti-drug conference in Tehran attended by many foreign diplomats Tuesday, were a rare diatribe by an Iranian official targeting the Jewish faith, rather than the state of Israel. "The spread of narcotics in the world emanates from the teachings of the Talmud ... whose objective is the destruction of the world," Rahimi said in comments published by the official website of President Mahmoud Ahmadinejad and state media. "The Talmud teaches that it is lawful to acquire wealth through legal and illegal means ... which gives [the Jews] the right to destroy humanity." Rahimi added, "If one seeks what lies behind all forms of corruption, there is the repugnant face of Zionists. This is the same case for the narcotics trade ... whose primary operator is the Zionist regime. The Zionists spread destruction not only by drugs, but also by [attacking] cultures." Iranian officials have repeatedly courted international outrage with tirades against the state of Israel, but criticism of Judaism as a faith has been rare. The Talmud is a book of oral tradition derived from the Jewish holy book, the Torah, that contains all the principles that govern daily life. Egypt’s Foreign Ministry said Wednesday it had told Israel that it would not be “appropriate” for Israeli pilgrims to make an annual visit to the tomb of a 19th-century Jewish holy man in the Nile Delta. Egypt notified Israel two months ago that it would be “impossible to hold the annual ceremony because of the political and security situation in the country,” the official, who spoke on condition of anonymity, said. Wednesday's announcement came as Muslim Brotherhood activists mobilized to block the pilgrimage route. Ceremonies at the tomb of Rabbi Yaakov Abuchatzeira have triggered yearly political sparring in Egypt throughout most of the last decade. An Islamist politician involved in organizing protests against the march meanwhile said that visiting the gravesite in the village of Daymouta, 180 kilometers (112 miles) north of Cairo would be a “suicide mission” for Israelis. “Normalization (of relations) with Israel is forced on the people, and the visits too come against the will of the people and despite popular rejection,” said Gamal Heshmat of the Muslim Brotherhood. Egypt’s daily Al-Ahram newspaper reported Tuesday that 31 parties and groups had joined this year’s campaign to block Israeli pilgrims from reaching the site. A son to a chief rabbi of Morocco, Yaakov Abuchatzeira was revered by some Jews as a mystic renowned for his piety and for performing miracles. The elderly rabbi was making his way from his native Morocco to the Holy Land in 1879, when he fell ill and died in the Egyptian city of Damanhour near Alexandria. This is a sad little clip by the Forward's Nate Lavey recording the sorry state of the Borgel Jewish cemetery, the largest in North Africa, which contains 30,000 Jewish graves. A small number were transferred from another Jewish cemetery in the centre of Tunis, including the tomb of the famous Rabbi Hai Taieb (Lo Met). This central cemetery was turned into a park shortly after Tunisia gained its independence in 1956, and the vast majority of tombs bulldozed into the ground. Latest chapter in the never-ending saga of the Iraqi-Jewish archives being restored in Washington: Iraq has cut cooperation with the United States on archaeological exploration because Washington has not returned the archives, Tourism and Archaeology Minister Liwaa Smaisim told AFP. The fate of the archives, which were removed from Iraq following the 2003 U.S.-led invasion, is a long-running point of contention between Washington and Baghdad, which has for years sought their return. Smaisim, a member of powerful anti-U.S. cleric Moqtada al-Sadr’s movement, said in an interview with AFP that Iraq will use “all the means” to pursue the return of the archives. “One of the means of pressure that I used against the American side is I stopped dealing with the American (archaeological) exploration missions because of the case of the Jewish archives and the antiquities that are in the United States,” said Smaisim. “The American side made many moves and pressure (for Iraq) to resume work with them but this is a final decision,” he added. The ministry of culture says that millions of documents including the Jewish archives were transferred to the United States. The archives, which were found in the flooded basement of the intelligence headquarters in Baghdad in 2003, include Torah scrolls, Jewish law and children’s books, Arabic-language documents produced for Iraqi Jews and government reports about the Jewish community. *It is more accurate to say that the community left en masse not as a result of the creation of Israel, but the antisemitic backlash to Israel. Jewish Refugee Day: bring it on! Last week the Babylonian Heritage Centre at Or Yehuda near Tel Aviv welcomed a distinguished guest: Deputy Foreign minister Danny Ayalon came to deliver an address on the 71st anniversary of the Farhud. This appalling pogrom, incited by neo-Nazis on 1 and 2 June 1941, the festival of Shavuot (the word Farhud means Violent Dispossession), claimed the lives of at least 137 Jews, injuring 1,000 and wrecking and looting 900 Jewish homes. It shook the 2,600-year-old community to the core: Iraq’s Jews would never recover their self-confidence. Within 10 years, 80 percent of the Iraqi-Jewish community had fled to Israel as refugees. Danny Ayalon believes that a date as near to the Shavuot pogrom as possible should be declared Jewish Refugee Day. He has already submitted a proposal for a memorial day to Tourism Minister Stas Misezhnikov, who heads the Knesset’s symbols and rituals committee. The new memorial day would, he says, correct a historical injustice by finally recognizing the 850,000 Jewish refugees forced to leave their homes in Arab countries. Such recognition will have unavoidable political ramifications, by spotlighting a de facto, irreversible exchange of Jewish and Palestinian refugees between Israel and the Arab world. It goes hand in hand with another campaign to force the US government to distinguish between genuine Palestinian refugees on the one hand and their millions of descendants on the other. In a conflict where symbolism has been ruthlessly exploited by the Palestinian side – from keffiyehs to keys to special commemorations like Land Day and Nakba Day – Ayalon’s initiative will have powerful resonance. Schools in Israel will be encouraged to teach the neglected history of pre-Islamic, millenarian Jewish communities native to the Middle East and North Africa, while diaspora groups all over the world will be invited to mark the occasion with films, lectures or exhibitions. If the Jewish Refugee Day becomes an integral part of the Jewish calendar, the Israeli government will have come full circle. In the 1950s it insisted that Jews from Arab countries were Zionist immigrants returning to their homeland. A memorial day for displaced Jews will place the focus on the ‘push’ factors: Jews are being portrayed not as immigrants but as refugees, forced out against their will by violence and state-sanctioned persecution. The idea of a memorial day is not new: it has been mooted by the Egyptian-born professor Ada Aharoni for some years now. Professor Aharoni has been toying with a ‘Jewish Nakba Day’ to coincide with Palestinian Nakba Day on 15 May. But many have not been comfortable with the association with the ‘Nakba’, an euphemism for the failed Arab genocide of the Jews. Some have suggested that Jewish refugees from Arab countries should be remembered at Passover – a uniquely Jewish commemoration of oppression and freedom. Egyptian Jews in particular can point to the irony of their Second Exodus in modern times. But Ayalon’s idea of tying a nationwide memorial day to the Farhud is a shrewd one: this is a catastrophe that occurred seven years before Israel came into being. It cannot be rationalised as a backlash to the creation of the Jewish state. It is often argued that the Palestinians were not responsible for the plight of the Jews. In the case of the Farhud, the Palestinian Mufti of Jerusalem, Haj Amin al-Husseini, who spent two years in Baghdad before eventually joining Hitler in Berlin, had a direct hand in making the Farhud happen, by whipping up frenzied Jew-hatred in Iraq. The Farhud is a tragic example of unprovoked antisemitism. Its legacy of oppression and intolerance is still with us today. The way Palestinians are classified in terms of their refugee status holds both political and financial significance. Most of UNRWA's budget comes from the U.S., and so a shift in the way the U.S. Congress considers Palestinians can affect UNRWA's budget. Congress is now asking the U.N. for a report detailing how many refugees aided by UNRWA were actually displaced during the War of Independence, and how many have been granted refugee status through "inheritance." Congress' request comes after significant lobbying by Deputy Foreign Minister Danny Ayalon (Yisrael Beytenu). Ayalon has also been promoting a new memorial day on the Jewish calendar - Jewish Refugee Day, during which students will learn about the 850,000 Jewish refugees who fled from their native Arab countries since the establishment of the state. Ayalon has already submitted a request on the matter to Tourism Minister Stas Misezhnikov (Yisrael Beytenu), who heads the Knesset's symbols and rituals committee. Ayalon suggested the new memorial day be set near Shavuot, on the day of the 1941 Farhud pogrom, during which 137 Iraqi Jews were murdered. Ayalon said introducing the new memorial day would correct a historical injustice by finally recognizing the hundreds of thousands of Jewish refugees and victims who were persecuted and forced to leave their homes in Arabs countries. The U.S. Congress is seeking clarifications over why it is that only Palestinian refugees are able to pass the "refugee" status down from generation to generation, while every other refugee in the world cannot. A lot has already been written about the U.N. body established specifically to assist Palestinian refugees – the United Nations Relief and Works Agency for Palestine Refugees, or UNRWA. It has become a professional organization, that provides many employees with a steady living, but it does very little to resolve the refugee status of the Palestinians. The bulk of UNRWA's budget comes from the U.S.
On this day, our schools should teach Joan Peter's book "From Time Immemorial: The Origins of the Arab-Jewish Conflict over Palestine" (on the demographics of the Arab population of Palestine and of the Jewish population of the Arab world before and after the establishment of the State of Israel). Peters found that only when it came to Palestinians did the U.N. alter its classification of refugees to apply to people who lived in the territory for only two years prior the establishment of Israel. Why did the criteria need to be changed? Because many of the refugees arrived in the area on the heels of the Zionist enterprise and the British mandate in search of work. Somebody should tell Israel's African infiltrator population – they have been here for more than two years, and they, too, can demand a right of return to Israel. The synagogue in Alexandria, Egypt’s second largest city, is considered to be the biggest in the Middle East. It was built in its current form in the mid-19th century, but prior to that it was destroyed twice – the last time under the decree of Napoleon. It was later repaired by an Italian architect and financed by members of the local Jewish community together with Sir Moses Montefiore. In the ancient days of the synagogue, Alexandria was home to a thriving Jewish community. The masterpiece of the spiritual activities in the city was the “Seventy Translation,” which translated biblical verse to Greek. Even the Jewish philosopher, Philon (of Alexandria), lived in the city. In 1940, the Jewish community was 40,000 members strong, but in the years that followed, the numbers dwindled as a result of a fear that the Nazis would advance to Egypt, and following that as a result of the rise of Abdel Nasser’s regime. By the 1990s, only 50 Jews were registered as living there. The Eliyahu Hanavi synagogue still stands in Alexandria today and is maintained by one Jew living in the city and by Egypt’s Supreme Council of Antiquities, which considers it both historically and archaeologically important. The authorities had intended to carry out wide-scale renovations of the place, but those plans fell through when Hosni Mubarak was ousted. The remains of Aharon Zindani, a Jew murdered in Yemen's capital Sana'a three weeks ago, will be buried in Israel, The Jerusalem Post reports. His family has accompanied his body on a flight from Yemen. They plan to stay in Israel. The body of a Jewish man murdered in Yemen three weeks ago will be laid to rest in Israel on Thursday. The Jewish Agency for Israel announced a plane carrying the remains of the victim Aharon Zindani landed at Ben-Gurion Airport on Wednesday evening. It said his family members were also on the flight, which was organized by the Jewish group with assistance from the Foreign and Defense Ministries, and plan to stay in Israel. Zindani was stabbed to death when he went shopping at a market in Sana'a, Yemen's capital. His son, who was reportedly with him at the time of the incident, was quoted as saying he knew the assailant and that the murderer believed Zindani "ruined and bewitched him." The Jewish Agency for Israel said the attack was apparently anti-Semitic in nature. There are some 130 Jews living in Yemen, an impoverished nation on the southern tip of the Arabian peninsula. Update: The Jerusalem Post reports that the organisation Reporters without Borders 'fears the worst': Mawlud Afand has been missing for 11 days. The editor of the Israel-Kurd Magazine, Mawlud Afand, has reportedly been kidnapped in Kurdistan and smuggled into Iran. Magazine publisher Dawod Baghestani, who founded the Israeli-Kurdish Cultural Association monthly newspaper in Iraqi Kurdistan in 2003, suspects that Sherzad Omar, a man working for Iranian intelligence in Kurdistan, slipped an anaesthetic drug into Afand's food and drove him across the Iranian border into Kermanshah. He was seen being given a bag by a man who spoke Farsi. In an email to Point of No Return, Baghestani, who is believed now to be in Turkey, says that he has tried contacting Afand on his mobile but it is constantly busy. He is determined to find out what happened to Afand and is appealing for information. This 34-minute film by David Kahtan is a must-see: it illustrates the treatment of Jews by the Iraqi regime in the mid-60s. In 1969, nine Jews were hanged in Baghdad's main square on trumped-up spying charges. Had he not managed to escape, Moshe Kahtan is convinced he would have been the tenth. In this film, made by his son David, Moshe tells us of his “two years of hell” in the city of his birth, and gives an account of his near-capture by the Iraqi navy. Raphael Luzon, a Libyan-born Jew whose family was forced into exile in 1967, said the general director of the Libyan Prime Minister’s Office promised talks would start after a constitution is drafted in 2013. Luzon would not disclose the name of the official he met, but said it was public knowledge in Libya. Most Libyan Jews left for Israel during the late 1940s and early 1950s. Those who remained were forced out by Gaddafi in the late 1960s leaving their personal assets behind. The flamboyant dictator’s regime also confiscated Jewish communal property, in one case paving a highway over the ancient Jewish cemetery in Tripoli. Luzon, who lives in the UK and is part of a group of Jews born in Libya with property claims in the country, said the assets involved were considerable. “I saw files like my father’s who left $10 million, but there are others that left even $100m.,” he said. Meanwhile, Libya continues to suffer from chronic political instability. General elections now set to take place next month have been postponed several times as violence between tribes has flared. In light of the circumstances the question of Jewish rights remains on the backburner. On June 17, 2012, Iraqi Jews will commemorate the 71st anniversary of the Farhud – the riots that took place on Shavuot in 1941. In the riots, reminiscent of Kristallnacht in Germany, 137 Jews (180 or more according to some sources), men, women and children, were murdered, hundreds more wounded and much Jewish property looted. The memory of the riots remains fresh in the minds of Iraqi Jews. This year’s ceremony will be held in the Babylonian Jewry Center in Or Yehuda and will be attended by Deputy Foreign Minister Danny Ayalon. The attacks occurred without provocation. The Jews, who had lived in Arab lands for thousands of years, did not declare war on their hosts. They never fought against them, as the Arabs in mandatory Palestine fought against the Jewish settlements and afterwards against the nascent Jewish State of Israel. The world has heard a great deal about the injustice visited upon the Palestinians, under the code name Nakba, or “catastrophe,” but knows almost nothing about the crimes committed against Jews in Arab lands. What happened in these countries was in effect ethnic cleansing. While the Nakba is marked every year with demonstrations and wide media coverage, the “Jewish Nakba” does not merit any public or media notice. This despite the fact that the human and physical dimensions of the disaster that befell them were larger: the number of Jewish refugees forced out of their homes with nothing but the clothes on their backs was about 856,000, while the Arabs who left Mandatory Palestine numbered about 650,000 according to UNRWA statistics. The attacks against the Jews of Arab lands occurred before the establishment of the State of Israel. In Iraq they began with discrimination, in the economy, in education and public life. Afterwards, Arab nationalism ignited rioting against the Jews, which came to a peak in the Farhud of 1941. Similar tragedies befell the Jews of Libya, Aden and other Arab countries. The combination of xenophobic Sunni nationalism and anti-Semitism produced a powerful hatred of the Jews. This hatred was abetted by Nazis such as the German envoy to Baghdad, Dr. Fritz Grobba, and pseudo- religious leaders such as Haj Amin al-Husseini (who fled from Mandatory Palestine and found in Iraq a convenient venue for his anti-Jewish activities). The Jews were left with no choice but to flee from the countries they had helped to found and bring into the modern era with their contributions to government, the economy, medicine, education, literature, poetry and music. The threatening anti-Jewish climate that prevailed in every Arab country was accompanied by inflamed anti-Jewish declarations, even from the podium of the United Nations. Government harassment and popular attacks drove the Jews of the Arab world to migrate en masse to Israel. In Egypt, a mass expulsion took place in the dead of night; the Jews were forced to leave behind their personal and communal property – including schools, ancient synagogues and cemeteries, prophets’ graves and hospitals. The Arab authorities confiscated the property. There were certainly Muslims in the Arab countries who did not support the attacks on the Jews, but their voices were not heard. The Jews were the scapegoats in internecine power struggles between the Sunnis and the Shi’ites, just as today Israel is at the center of the struggle between the Shi’ite Iran and the Sunni states, with Turkey at the forefront. In recent years, a process of awakening can be discerned in the Arab world, especially among intellectuals, who recognize that it was not only the Palestinian Arabs who suffered a “nakba,” but that the Jews of the Arab world had their own catastrophe. Arab leaders – Palestinians and others – would do well to stop parroting the slogan “the right of return” and deluding their people, because there is no turning back the wheel of history. Only a dialogue with Israel for coexistence will bring a genuine basis of justice and truth. Judy Feld Carr, the Canadian mother credited with helping Jews escape Syria in the 1990s, was finally granted the recognition she deserves this week, the Jerusalem Post reports. She was awarded Israel's Presidential medal. Feld Carr – a musicologist, mother of six and grandmother of 13 who lives most of the year in Toronto – says she secretly and discreetly used money and connections to help Jews get out of Syria. In an interview at the Jerusalem home in which she and her lawyer husband, Donald Carr, often spend part of their summers, Feld Carr smiles when asked why she was given the prize. Based in Toronto, she devoted herself to working with smugglers and bribing government officials to save Jews from the hostile Syrian regime, methodically keeping files on each one of them. “I started a communication with Syria at the end of 1972. I took my first person out of Syria by ransom – a rabbi from Aleppo – in 1977; I finished the morning of September 11, 2001, an hour before the Trade Center tragedy happened,” she explains, matterof- factly. Her interest in Syria started when she and her first husband, Rubin Feld, clandestinely started sending “religious books” to the country from Canada, and she was later approached by a couple of Syrian Jews who came to Toronto to visit her. She makes a point of expressing her gratitude to her home country of Canada for enabling her to conduct her rescue operation there without word getting out to the rest of the world. “Canada is another best-kept secret. I could do things quietly in Canada and not be seen by the press or the media,” she says, emphatically. “A lot of my neshama [soul] has been in this. I did this quietly for 28 years, and I raised all the money quietly – no dinners, no parties, no fund-raising. All the money was raised by my best friend and a few other people on a committee that I had in Toronto and me. Asked how she pulled it off, Feld Carr still cannot tell the whole story, which apparently involved paying smugglers to take Jews through other Muslim countries, or paying for their release and flying them to the United States. But, she stresses, it was extremely tough. Feld Carr has been awarded a number of top honors over recent years, including an appointment as a member of the Order of Canada and the Queen Elizabeth II’s Diamond Jubilee Medal. In 1995, then-prime minister Yitzhak Rabin was the first to acknowledge her “extraordinary work,” in a letter which now hangs on her wall: “Now that for all practical purposes, the entire Syrian Jewish community has left Syria, the time for thanks is here – first and foremost to you,” Rabin wrote. Israel Broadcasting Authority Channel 1’s made a documentary about her work titled Miss Judy, which was shown at the Toronto Film Festival. Writing in The Forward on Oct. 21, 2011, former district attorney Robert Morgenthau and law professor Frank Tuerkheimer claim to have discovered that President Franklin D. Roosevelt "saved the Jews of North Africa and the future State of Israel" by invading Axis-occupied North Africa. It was a stroke of good fortune that the Allied victory in North Africa in 1942 happened to stop the Nazis from, among other things, massacring the Jews of Palestine. But for Morgenthau and Tuerkheimer to suggest that it was Roosevelt's intention to rescue those Jews is misleading, to put it mildly. It would be like saying that Stalin "saved the Jews of Moscow" when the Soviets stopped the advance of the German Army at Stalingrad, or that Churchill "saved the Jews of London" when the German attack on England was repulsed. But what makes the Morgenthau-Tuerkheimer thesis especially ironic is that it fails to mention the explosive controversy over the anti-Jewish policies that FDR permitted in Allied-liberated North Africa. On November 8, 1942, American and British forces invaded Nazi-occupied Morocco, Algeria, and Tunisia and, in eight days, defeated the Germans and their Vichy French partners. For the 330,000 Jews of North Africa, the Allied conquest was heaven-sent--or so it seemed. The Vichy regime that had ruled since the summer of 1940 had stripped the region’s Jews of their civil rights (originally granted back in 1870), severely restricted their entrance to schools and some professions, confiscated Jewish property, and tolerated sporadic pogroms against Jews by local Muslims. In addition, thousands of Jewish men were hauled away to forced-labor camps. President Roosevelt, in his victory announcement, pledged “the abrogation of all laws and decrees inspired by Nazi governments or Nazi ideologists." Behind the scenes, Roosevelt had cut a deal with Admiral Francois Darlan, a senior Vichy official who happened to be Algiers at the time of the Allied invasion. In exchange for persuading some of the local forces to surrender, Darlan was named High Commissioner for North Africa. Nearly all of the top officials of the local Vichy regime were permitted to remain in the new government. The Vichy “Office of Jewish Affairs” continued to operate, as did the forced labor camps in which thousands of Jews were imprisoned. Charles de Gaulle and the anti-Nazi French resistance were of course outraged. And so were many prominent Americans. Mr. Morgenthau's father, Treasury Secretary Henry Morgenthau, Jr., was "apoplectic," FDR biographer Doris Kearns Goodwin reports. She quotes Secretary of War Henry Stimson's observation: "Poor Henry was sunk. He was almost for giving up the war which he said had lost all interest for him." An editorial in The New Republic urged its readers to imagine how they would feel if the Germans had occupied part of the United States, and then when the British liberated the area, they permitted Father Coughlin and Charles Lindbergh to run the government. Darlan and company claimed that rescinding the anti-Jewish laws would cause local Arabs to riot. Secretary of State Cordell Hull agreed. So did General George Patton, who warned from Morocco that "local Jews" would "try to take the lead here," thus angering the Arabs. American Jewish leaders did not know of FDR's private comments about Jewish professionals. Undoubtedly they would have been shocked and horrified if word had leaked out. (The transcript was not made public until 1968.) But they did know that the promised restoration of the rights of North African Jewry had not taken place, and as the weeks turned into months, they started wondering why. Although reluctant to take issue with the Roosevelt administration, by the spring of 1943, Jewish leaders began speaking out. The American Jewish Congress and World Jewish Congress charged that “the anti-Jewish legacy of the Nazis remains intact in North Africa” and urged FDR to eliminate the Vichy laws. Leaders of the American Jewish Committee met with Undersecretary of State Sumner Welles to press for abrogation. Are we in the Sahara? Somewhere in deepest North Africa? No, this is Israel. Ashdod, then a town of 30,000, where modern blocks rise out of the dunes, was in the mid 1960s known as Little Algeria - home to several thousand Jews from that war-torn country. The interviewer is delighted to see that even the policemen here speak French. As most Algerian Jews had French nationality, France would have been the logical choice for these refugees. Some of those interviewed still feel they made the wrong choice: "France is bigger, more beautiful, more fun for young people," says one teenager. He would like to go and live in France so that he could see the singer Enrico Macias. Other reasons pull families back to France - one man working in immigrant absorption says that of 300 families who came to Ashdod, only 130 families remain. They move back for sentimental reasons, to join their families in France, or more likely because France gives them compensation (for lost property). One doctor who plans to return to France blames the social divisions between Ashkenazim and Sephardim for his failure to integrate. But others, who feel professionally fulfilled, say discrimination has not been an issue for them. Bismuth and Lellouche are secular Jews who live far more cosmopolitan lives in Tunis than their co-religionists in Djerba. Both hail originally from the seaside town of La Goulette, which used to have a significant Jewish population. But they are very much men of their respective, quite different, times. Bismuth, who was born in 1926, is a survivor of the Nazi occupation of Tunisia. He became a multinational businessman and is, perhaps, the most famous Jew in the country. As a major figure in the community, Bismuth was close to Ben Ali. In 2005 he was listed in U.S. diplomatic cables, later leaked via WikiLeaks, as a “notable” Ben Ali loyalist. His election in 2005 to the Tunisian Senate made him one of the few Jewish legislators in the Arab world, though the body itself was toothless. Perhaps unsurprisingly, Bismuth has fond memories of the old government — and contempt for Tunisian revolutionaries. (Photo: Nate Lavey) Jacob Lellouche, a kosher restaurant owner, ran for the Constituent Assembly following the revolution. High unemployment has been a central complaint for Tunisians with and without degrees, but not for Jews, Bismuth said. “The Jews work! These unemployed people… they don’t want a job, they want a salary. Working for them is not a need, where for us [Jews], we cannot think of not working,” he said. Lellouche, who is more than 30 years younger than Bismuth, believes that the revolution had broader goals and that it “was made in the name of dignity and democracy.” He believes it holds opportunities, too, for Tunisia’s Jews. Under the Ben Ali regime, “it was not really possible to create a Jewish association,” he explained. For years, Lellouche wanted to found a group that, unlike Bismuth’s, operated independently of the Ben Ali government to promote Jewish cultural heritage in Tunisia. And after the revolution, he did just that. Why is the Guardian promoting a genocidal fascist? The Guardian's decision to post an online article by the Hamas Prime Minister Ismail Haniyeh was too much to bear for Charlotte of the Digital Politico blog. From now on she will not read or buy an newspaper that flaunts its left-liberal credentials, but is actually in bed with a genocidal fascist. Lyn Julius traces Hamas's history of pro-Nazi antisemitism through the Muslim Brotherhood in this post for the Times of Israel. From the 1930s – well before the creation of Israel – the Muslim Brotherhood was agitating against the Jews of Egypt, Palestine and Syria. By 1945 the Muslim Brotherhood had a million armed supporters in Egypt. The Third Reich financed and trained the Muslim Brothers of Palestine and Egypt in terrorism. The Nazi concept of the Jews as the epitomy of all-controlling evil was exported to the Arab world, where it is entrenched to this day. Hitler shared his plans to kill the Jews of Europe with the main ally of the Muslim Brotherhood in Palestine, the Mufti of Jerusalem. The Mufti ‘s machinations led to a pro-Nazi coup in Iraq, and the murder of hundreds of Iraqi Jews in the Farhud pogrom in June 1941. Meeting in Berlin a few months later, Hitler and the Mufti agreed a plan to exterminate all the Jews of the Middle East. From 1947 Arab governments set about making the Arab Middle East Judenrein. They applied Nuremberg-style laws, criminalising Zionism, freezing Jewish bank accounts, instituting quotas, imposing restrictions on jobs and movement. The result was the mass exodus and spoliation of a million Jews. Nazi-style bigotry, coupled with traditional Islamic antisemitism, remains the driving force behind the marginalisation and exclusion of minorities from the Arab world on the one hand, and the unremitting campaign to destroy Israel on the other. The ghost of Nazi-inspired, anti-Jewish fundamentalism was never exorcised from the Arab world. The Mufti of Jerusalem should have been tried as a war criminal at Nuremberg. He was indicted, tried and convicted by Yugoslavia for crimes against humanity. But the Allies shrank from offending the Arabs. That is why today in the Arab and Muslim world, antisemitism is epidemic. The reason why The Guardian gives a platform to genocidal fascists is less easy to fathom. The Left has always dabbled in antisemitism – the ‘socialism of fools’. Israel has been cast as the US’s little imperialist helper. No-one seems to remember that Egypt, Saudi Arabia, the Gulf States, Iraq, Bahrain and much of the rest of the Arab world are also well within the US sphere of influence. The so-called red-green alliance, for which The Guardian is a cheerleader, has bought into the myth that Israel is a colonial project. This brazen lie both denies the Jews’ 3,000–year-old connection to their ancestral homeland, and ignores the fact that 50 percent of Israel’s Jewish population descend from refugees indigenous to the Arab and Muslim world, predating Arab Muslim colonialism by centuries. Then there is the misplaced belief that an extremist party like Hamas will be tamed by the responsibilities of power and needs to be engaged with. No sign of such moderation yet. 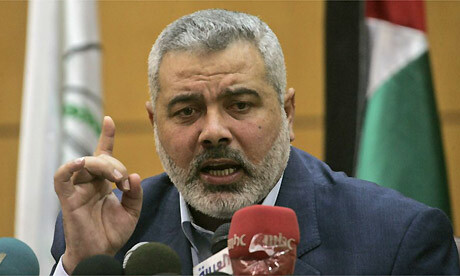 Finally, The Guardian’s decision to feature Haniyeh could simply be a hardnosed, commercial one: controversy sells. Losing principled readers such as Charlotte of Digital Politico is evidently a price it is prepared to pay. A High Court of Justice petition submitted on Sunday claims that thousands of families were evacuated from Lifta, Shalem, Summayl and other villages in an illegal, discriminatory fashion to advance real estate deals. The impetus for the claim was the discovery by a Lifta resident of a 1958 document which was allegedly hidden from residents in these villages, and which indicates they have rights to the homes. Attorney Gilad Harish, who submitted the petition, says that for decades, the state concealed documents and decisions holding that the residents, most of them Jewish new immigrants, have rights to the dwellings, which were abandoned by Palestinians during the 1948 War of Independence. The documents were concealed, Harish maintains, so the residents could be designated as trespassers the properties re-allocated for real estate purposes. The complaint has been submitted against the Ministry of Construction and Housing, the Israel Lands Administration and the state-owned Amidar public housing company. The petition asks the court to issue an immediate injunction to halt evacuation procedures currently underway in Lifta, Shalem and other villages. Justice Yoram Danziger ordered the state to respond by July 15. The petition was submitted as a result of Lifta resident Yoni Yochanan's refusal to evacuate the home where he's lived for dozens of years to make way for a construction project. Yochanan conducted research about the history of Lifta and other local villages which previously belonged to Palestinians. In his research, Yochanan uncovered a 1958 Finance Ministry memorandum which held that "a resident who lacks a lease" but who can prove that he lived in a home in Lifta or other nearby village in April 1954 was entitled to a lease. This ruling indicates that residents evacuated over the years from Lifta and other areas could have obtained rights to their homes, and would now be entitled to compensation payments, the petition argues. An additional 1958 document indicates that residents in Lifta and elsewhere were eligible for priority rights to purchase the dwellings where they lived. In case you haven't heard of him, Peter Beinart (pictured) is the new enfant terrible of the US Jewish community after he caused a stir with his new book The Crisis of Zion. In the post below he wrote for Open Zion, we can now see what Beinart thinks of Sephardi/Mizrahi Jews. What a bitter disappointment. Instead of gaining an insight into Middle East politics from his Egyptian grandmother, he naively concludes that Mizrahim must be freed from hatred and self-hatred! My comments are interposed in bold. "In my youth, I noticed an odd dynamic in my extended family. My Sephardi grandmother, born in Alexandria, Egypt, often denounced “the Arabs,” a group toward which she felt a kind of intimate hostility. When I said something about the Middle East that she deemed naive, she’d insist that if I understood Arabic, as she did, I too would understand the capricious, treacherous Arab mind. With all due respect, what a bunch of ignoramuses Beinart’s Ashkenazi relatives are. Jews from Arab countries are not Arabs. Even Egyptian non-Jews do not see themselves as Arabs. (Beinart’s grandma came to Egypt from Rhodes, I believe. That makes her Greek/Italian.) It is undeniable, however, that there is an undercurrent of anti-Mizrahi prejudice amongst Ashkenazim. It is strongest on the Left (yes, those who often claim to be most tolerant). The reason is very simply because the Sephardim vote rightwing and appear to be embarrassingly bigoted against Arabs. One surmises that Beinart’s grandma had a healthy suspicion of the Arabs, borne of first-hand experience of being driven out of an Arab country. "All this came flooding back when I noticed this weekend’s comments by Israeli interior minister Eli Yishai about the Eritrean and Sudanese migrants whose presence has sparked such ugliness in Israel in recent weeks. “Most of those people arriving here are Muslims who think the country doesn't belong to us, the white man," Yishai the Israeli newspaper Maariv. Well, Yishai may not be as white as Peter Beinart, but he is quoting what black African economic migrants who have flooded into Israel in their thousands say to Israelis. Beinart took his remarks out of context, trying to paint Yishai as a racist behaving like a 'white' colonialist in spite of the fact he is himself 'black.' Yishai is of course from Africa too, but as a Jew, he is entitled to live in the Jewish state. The economic migrants are not. "Yishai’s comments illustrate the awful paradox of contemporary Sephardi (or more accurately, Mizrahi) identity. As in my own family, Jews from Arab lands were long seen by their haughty Ashkenazi cousins as, well, Arabs. Intra-Jewish bigotry has certainly declined since Israel’s early years, when David Ben Gurion said that Israel’s Mizrahi immigrants had “no Jewish education.” But it persists. A Mizrahi friend who speaks Hebrew with the guttural pronunciation indigenous to the Middle East recently told me that he is routinely hassled at Ben Gurion airport because his Hebrew sounds too much like Arabic. In her fascinating book, We Look Like the Enemy, Rachel Shabi tells of swarthy Mizrahi Jews who in order to avoid being mistaken for Palestinians by the Israeli police begin wearing kippot or Jewish stars. There is no paradox, except in the minds of the ignorant. Rachel Shabi’s book (fisked here) belongs in the 1950s. She cherry-picks passe examples of ‘discrimination’ against Sephardi Jews. One could equally write a book illustrating what a success story the integration of Sephardi Jews has been; how many oriental Jews have done extremely well in Israel, reaching the highest echelons of army and government. Another sweeping generalisation, this. Some Ashkenazim may call Sephardim 'black' but their children are intermarrying with them in their droves. As Beinart himself admits, the age of intra-Jewish bigotry has passed. "Now along comes Yishai, the leader of Shas--a party born to give voice to the very Mizrahi Jews long considered black--to declare that Israel must expel its African migrants because Israel is for “us, the white man.” (As you might imagine given the gendered language, Yishai doesn’t have particularly enlightened ideas about women either). "This is the same Eli Yishai who in 2010 denounced a lawsuit by Mizrahi Jews protesting their school’s decision to segregate Mizrahi girls from their Askhenazi classmates. The lawsuit, Yishai feared, would upset the Ashkenazi ultra-Orthodox leadership that Shas’s rabbis mimic. So despite being ‘black’, Yishai is upholding ‘white’, ultra-orthodox values. Yet this example shows that Yishai is not above using the ‘race card’ himself. How very confusing! Partly out of disgust, a rebel Shas parliamentarian, Haim Amsalem, last year launched a new Mizrahi political party aimed at fighting discrimination and promoting a “unifying and tolerant Jewish approach” to social divides. Amsalem, an Israeli hero almost unknown among American Jews, represents a radically different Mizrahi spirit, freed from both hatred and self-hatred. His party is called Am Shalem (Whole Nation). Whole nation: black, white, Arab, Jew and yes, Arab Jew as well. It is not disgust with Yishai propelling Amsalem, so much as a desire to revert to traditional Sephardi orthodoxy, outward-looking and integrated in secular life. As journalists, we were in Kasserine to probe the poignant banality of the places and people that launched the greatest wave of civil protest the modern Arab world has ever seen. The two labor organizers we were scheduled to interview were typical of the kind of activists who had helped the Sidi Bouzid protests go national. Their concerns were local—the regional illiteracy rate hovered at 35%, and unemployment wasn’t much lower than that. But when the protests began, these were the people who had helped flood the streets with discontented union members, breaking Ben Ali’s meticulous illusion of absolute control. I wanted to like and respect these people. But my colleague and I would find this quite impossible. “Are you a Zionist?” the plumper of the two men asked us, before we could even get a question in. If we were, the interview was off. My journalist friend had interviewed members of Hezbollah—actual terrorists, in other words—and they had never asked him such a question. Later in the interview, the activists explained that their union encompassed the entire political spectrum in Tunisia, accommodating communists, Islamists, really anyone who stood up for the rights of the country’s workers. I asked if they would tolerate a party that wanted to restore the diplomatic relations that Israel and Tunisia had maintained until 2000. Now nothing feels more dishonest than mindlessly nodding along to something that I privately consider to be poisonous nonsense, but it’s a position that only the most timid of journalists will never find themselves in. When this happens, you know you’re not in immediate physical danger or anything, but you can feel the tension rise as your conscience bristles, and as your own self-censorship becomes a very real part of the news-gathering process. Will I give anything away? I wondered. Am I about to be angrily expelled from this office—from this town perhaps? The answers to these questions were “no” and “probably not,” but the discomfort was tangible. As the meeting progressed, I found myself cycling through all the coastal stereotypes about those backwards and uneducated Tunisian country folk, and even guiltily agreeing with a few of them. Except that in Tunis, the prevailing views on Israel—even among members of the educated, liberal establishment—were even worse. Where's the outrage when Jews are murdered?